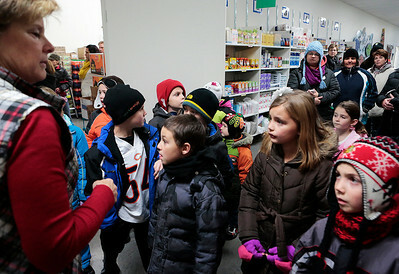 Kyle Grillot - kgrillot@shawmedia.com FISH Food Pantry Volunteer Sue Kapraun (top left) gives a tour of the pantry to Riverwood Elementary School students and other children including Andrew Harris, 3, (from bottom left) Jenna Harris 6, Carter Nieman, 7, and Brandin Amelio, 7, Monday in McHenry. Riverwood second-graders donated $600 worth of groceries as part of the Kids Give Back curriculum, courtesy of Peapod an online grocery delivery service. The FISH Food Pantry provides upward of 12,000 pounds of food to 600 local families in need each week. 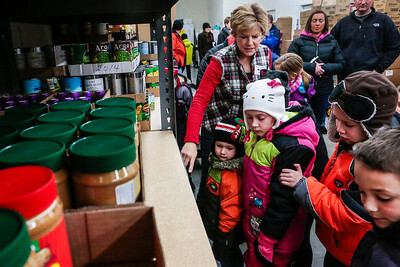 Kyle Grillot - kgrillot@shawmedia.com Parents and second-grade teachers including Jennifer DeBlok (top right), Lisa MicklingHoff (center), and Cheri Ryba (right) unload groceries at the FISH Food Pantry Monday in McHenry. Riverwood second-graders donated $600 worth of groceries as part of the Kids Give Back curriculum, courtesy of Peapod an online grocery delivery service. The FISH Food Pantry provides upward of 12,000 pounds of food to 600 local families in need each week.